Make Skillet Shrimp when you’re short on time, but don’t want to compromise on dinner or your diet. Follow this easy 10-minute process to cook tender, tasty shrimp every single time. Cooking shrimp on the stove-top is my favorite way to make this delicacy because it’s easy to monitor the cooking process and pluck shrimp from the pan at the perfect time. The result? Tender shrimp that’s never chewy. We use the same technique to make Cauliflower Grits and Shrimp, Shrimp Zoodles and even Pan Seared Scallops. It’s a classic butter and/or olive oil flavoring that’s easily customized based on how you will use it. I find myself making stove-top shrimp all the time for salads, soups, and pasta. It’s high in protein, low in calories and tastes amazing. What’s not to love? All shrimp lovers should have this technique in their arsenal. Defrost shrimp if necessary. If you didn’t move shrimp from the freezer to thaw overnight in the refrigerator, then run it under cold water for about 5-7 minutes. Thoroughly pat it dry before cooking. Devein shrimp – To do this cut a small slit down the top of each shrimp and pick out the black stringy digestive track with the tip of the knife. Repeat. Eating the “vein” will not harm you, but will detract from the look and possibly the taste. It’s a must at our house! Check out PopSugar’s take on this burning question here. Remove the tail if desired – This step is not an absolute must. It depends on your family and preference. 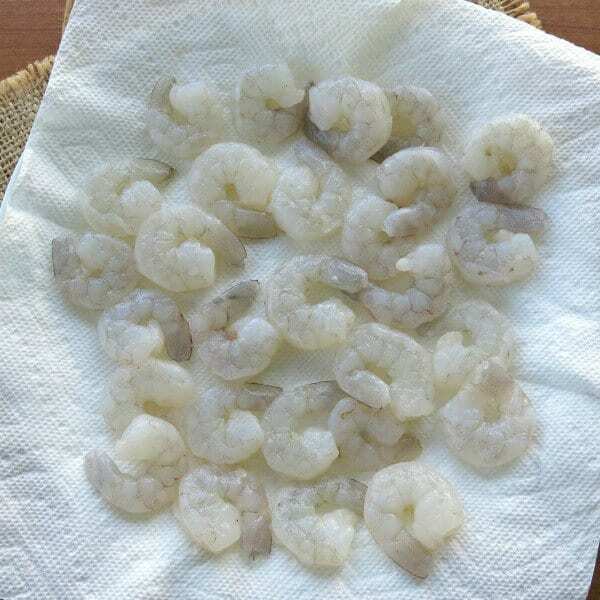 Pat shrimp dry with a paper towel. I’ve done all of these steps to save money. However, if it goes on sale, then I stock up. I have several bags in the freezer right on any given day! ANY type of shrimp will work including rock shrimp, white shrimp, and prawns. Larger shrimp are easier to work with, but are more expensive too. 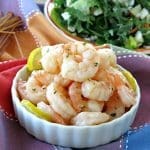 Check out Everything You Need to Know to Buy Better Shrimp by Serious Eats for information on various types of shrimp and tips to purchase. Melt 1 Tablespoon each butter and olive oil in a large frying pan or skillet over medium-high heat. Note: The proportion and amounts can be varied. Use 2 Tablespoons olive oil for a paleo compliant or dairy-free version. 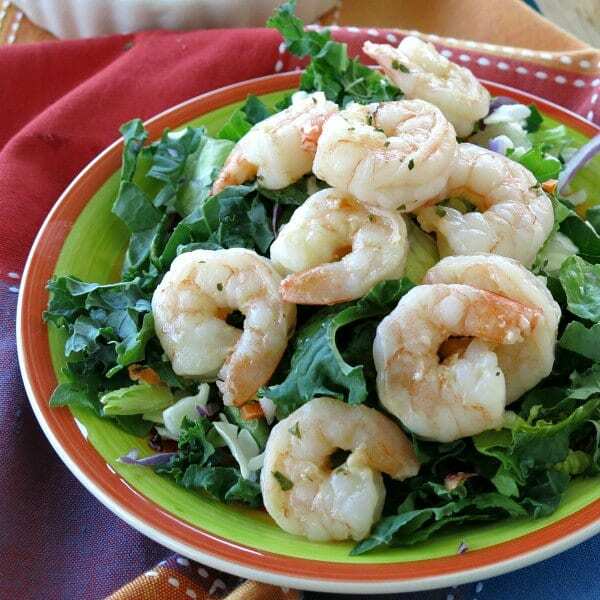 2 Tablespoons total is the minimum amount that will easily coat 1 pound shrimp and allow a minimal amount of leftover fat at the end. Up the amounts to have more butter and oil left at the end to make a sauce. Arrange shrimp in the frying pan in a single layer. If you’re doubling the recipe then the process will need to be done in batches. Allow shrimp to cook for about 3 minutes without touching it. The exact amount of time will be more or less depending upon the size of the shrimp. We used large-sized shrimp. At the 3 minute mark, use tongs or two forks, to flip each shrimp to the other side. Shrimp cooks in minutes and carefully tending to each one will allow them to all finish at the same time. However, another option is to use a spatula or large spoon to turn them. Watch shrimp closely as they cook and remove them from the pan as soon as they are done. Shrimp are pink, pale white and no longer translucent when done. They shouldn’t be bright white either because that signals they’ve been cooked a bit too long. Overcooked shrimp becomes tough and rubbery. Add a squeeze of lemon during or at the end of the process. Add fresh minced garlic or garlic powder when melting the butter. Remove shrimp from skillet and use leftover fat to stir fry vegetables such as broccoli, asparagus or carrots for a one-pot meal. Stir into pasta dishes like fettuccine alfredo. Check out these low-carb versions Zucchini Noodle Alfredo and Spaghetti Squash Alfredo. Serve with Lemon Garlic Zucchini Noodles or other vegetables. Once shrimp is removed from the pan, add in vegetables to saute and round out the meal. Top a salad, such as Caribbean Salad with Honey Lime Dressing. 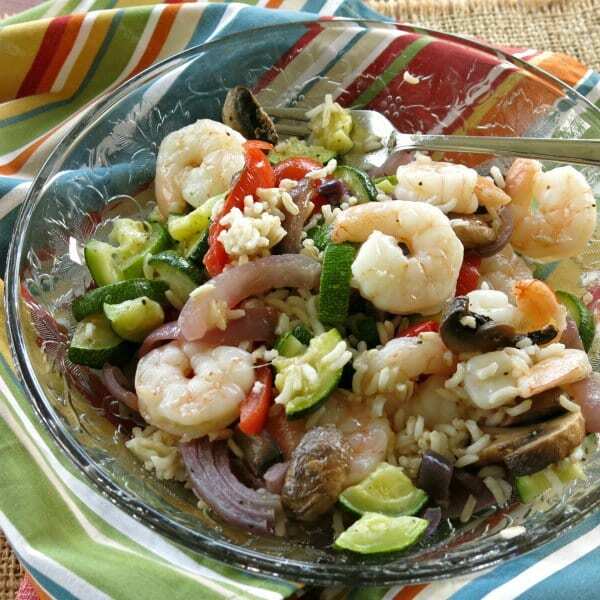 Serve with rice or make a bowl with roasted vegetables, shrimp, a squeeze of lemon and feta cheese. Toss in soups, such a Shrimp Tortilla Soup. Use on pizza – toss shrimp with pesto and compliment with tomatoes and mozzarella cheese. Make a deconstructed Shrimp Sushi Roll Salad – no rolling involved. This technique is definitely one of the top tricks for getting a tasty dinner on the table fast. Make tender, perfectly cooked shrimp every single time using this easy skillet shrimp recipe that's ready in 10 minutes or less! Add olive oil to pan and swirl to combine with butter and coat the bottom of the pan. 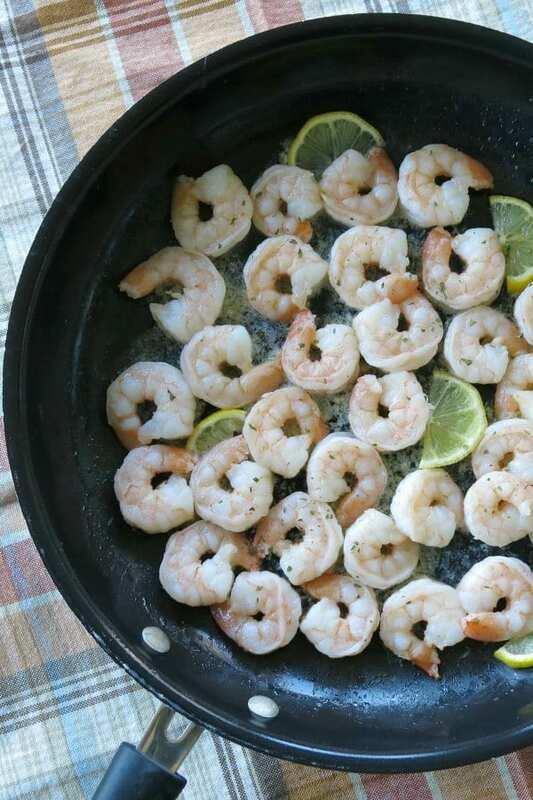 Arrange shrimp in the pan in a single layer. Cook for about 3 minutes more or until shrimp are cooked through and pink. Quickly toss to coat with sauce and remove from pan to enjoy. Note: The nutritional estimate assumes that ALL oil and butter is consumed. No adjustments have been made for amounts that are left in the pan. 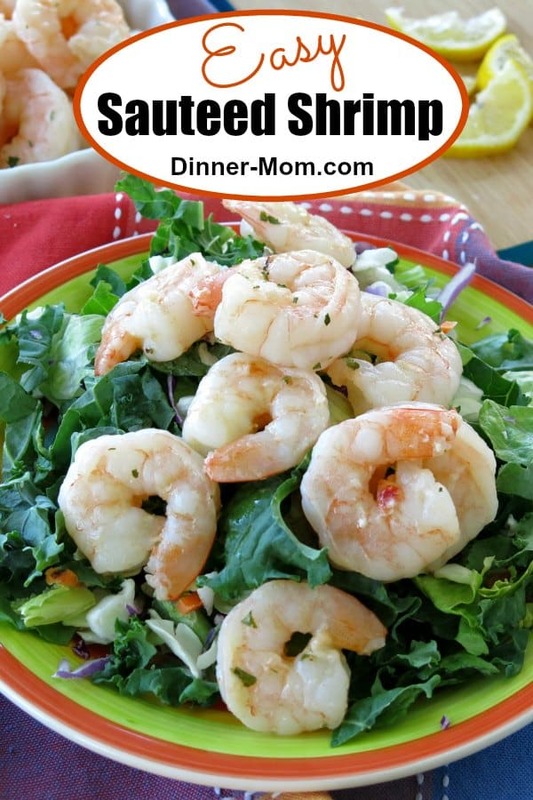 Thanks for simplifying the steps to get perfectly cooked shrimp every time! This is totally my kind of meal. Quick, yum and hearty.